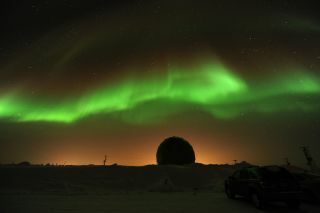 NASA space physicist James Spann took this stunning picture on March 1, 2011 from Poker Flat, Alaska, where he was attending a scientific conference to study auroras. The Moon is not visible on the date of New Moon because it is too close to the Sun, but can be seen low in the southeast as a narrow crescent a morning or two before, just before sunrise. It is visible in the low westsouthwest an evening or two after New Moon. The First Quarter Moon rises around 11 a.m., and sets around 2 a.m. The Full Moon of March is usually known as the Lenten Moon. In Algonquian it is called Worm Moon. Other names are Crow Moon, Crust Moon, Sugar Moon, Sap Moon, Chaste Moon, and Death Moon. In Hindi it is known as Basanta Purnima or Dol Purnima. Its Sinhala (Buddhist) name is Medin Poya. The Full Moon rises around sunset and sets around sunrise, the only night in the month when the Moon is in the sky all night long. The rest of the month, the Moon spends at least some time in the daytime sky. The Last or Third Quarter Moon rises around 3 a.m. and sets around noon. It is most easily seen just after sunrise in the southern sky. The First Quarter Moon passes just south of the brightest star cluster in the sky, the Pleiades (Messier 45) in Taurus. The tiny asteroid Juno will be well placed for observation this week as it nears opposition. At 9th magnitude, you will need binoculars or a small telescope to spot it in southern Leo. The planets Mercury and Jupiter are less than 2 degrees apart in evening twilight. This week is the best time for observers in the Northern Hemisphere to observe Mercury in 2011. Watch as brilliant Venus first rises in the east. Look with binoculars or a telescope half a degree above and to the right of Venus to spot tiny Neptune. Mercury is well placed for northern observers for the last two weeks of March. Look for it close to Jupiter in evening twilight. Venus is a brilliant “morning star” low in the southeast all month. Mars is too close to the Sun to be observed. It was in conjunction with the Sun on February 4. Jupiter is low in the western sky in the early evening, but vanishes behind the Sun towards the end of the month. Uranus is in Pisces all month. It is too close to the Sun to be observed. Neptune reappears in the dawn sky towards the end of the month, but is very difficult to spot even in a telescope.